For the crust, place dry ingredients in a bowl and gradually add water. Work to a dough and knead until smooth. Wrap the dough and leave at room temperature overnight. To sear the lamb, heat a heavy frying pan over a flame, season the lamb with salt and pepper. Add a splash of oil to the hot pan and then the seasoned lamb. Sear the meat on all sides (be sure to acquire good colour) and remove to a plate to cool. Divide the dough into four pieces and roll each into a disc, approximately 25cm diameter and 1cm thick. 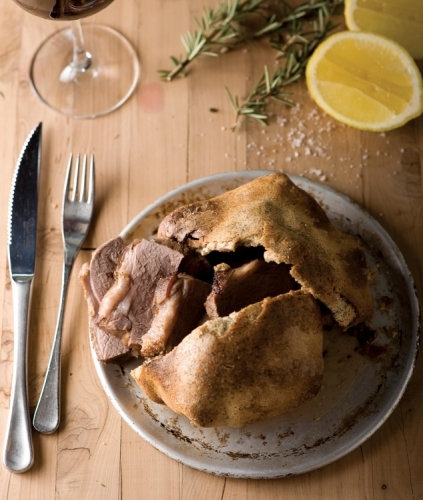 Dry the lamb on paper towel, place one rump in the centre of each pastry. Wrap the pastry up over the lamb and pinch together to create a seal. Place the lamb parcels seal down on a baking tray. Bake in a fan forced oven at 220°C for 18 minutes. Remove parcels from the oven and rest for 10 minutes before opening up and serving. Use sharp kitchen scissors to cut into the pastry. The crust is not edible, however it presents well. Slice the lamb and serve.